The people of DataDirect made a great product called XML convertors with this you can generate an Edifact message from a xml and back. This is not new but this java software can easily embedded in your own java program. In this blog entry I will show how you can generate an edifact message in a few hours and very flexible. This are the steps to generate an APERAK Edifact message from an Oracle table. Step 1 generate the xsd from xml convertor for our edifact message. In this example I want to generate an Aperak Edifact message so I first need a xml schema,then I know how the xml must look like. You have to do this only once. This how the xsd looks like. With Oracle xmldb we can generate the following xml from the database. You probably noticed I do not have all the required elements in this database xml to generate a complete edifact message. But we will solve this in the next step. With Altova XMLSPY I will generate a new XSD based on this example xml. Now we have two xsd's and a database xml, we can use Altova Mapforce to create a xslt which can transform the database xml to the more complex edifact aperak xml. Step 3 Use Mapforce to create a XSLT. I will use Altova Mapforce because with this program I can visual make a xslt and immediately see the result of the xlst. We need to import the two xsd's in mapforce and make the mappings between these two xsd's and add the missing data to the edifact aperak schema. This is the output of the xslt. Now we can generate the database xml and have an xlst to transform the xml to the edifact aparak xml. In the last step we can make the edifact message with the xml convertor software. What really cool is that xml convertor can detect the xml message and transforms it to the right edifact message so you only need this code for all your outgoing edifact messages. Conclusion, this is an flexible solution to generate an Edifact message. 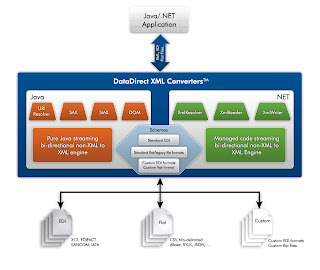 In your java application you can easily embed the xml convertor software and use the xslt to transform the xml. With this solution you can change your backoffice application or edifact message. You only have to change the xslt which is very easy in Altova Mapforce. One of the great things when you use Flex in combination Ruby is that you can easily change the communication method. For instance you can use xml rpc or json rpc or RubyAMF, just by changing the ruby controller. Off course when you use json then you need to download the corelib for Flex and when you use RubyAMF we need to install this plugin in ruby. But when you have a choice then you need to know what is the best communication method for your project. In this test I will measure the performance of the three methods. For this I made a simple Flex / Ruby project. Here are the average results in ms (100 times executed) with the total records count in our test table. RubyAMF has a little overhead and is fast with a large recordset and you can use remoteobject in Flex. Xml is fast but the performance can vary. With 1000 records it can take 200ms but sometimes 2000ms. It looks like Ruby can cache xml and sometimes refresh the cache. Json is very stable and fast with small recordsets. If you just want to retrieve some data in Flex, I would use json but when you want to do more with this data in Flex then RubyAMF has many benefits, like association between objects, conversion to actionscript class and a lot more. you can test the output by adding the format parameter to the url http://localhost:3000/departments/find_all?format=json or format=xml. A new version of GMaps4JSF was released. GMaps4JSF is a Google maps jsf component. This blog entry will show you how you can use it in your own 11g application. In this example you can hide and show markers. Add markers from a backing bean and add an click event on these markers so when you click on a marker you will get an alert. The first step to get this jsf component in JDeveloper 11g is to download the GMaps4JSF jar and import this jsp tag library in your own project. Here is the code for the JSF page. Very important that the method of the clientlistener starts with renderMap and add the id of the maps components to it else it won't work and the ADF splashscreen will not go away. <yui:map id="mapPrincipal" width="500px" height="500px" zoom="7"
Today Ted Farrell annouced that JDeveloper 11G ( codename boxer ) will be released on the 1st of october. This release will contain the ADF JSF RichFaces components and the new TaskFlows. These 11g components are certified to run on Weblogic 10.3 . Next year Oracle will release the bulldog version with the WebCenter and Soa components. I am now building a Mail Handling System for a customer and one of the customer non functional requirement is high availibility. 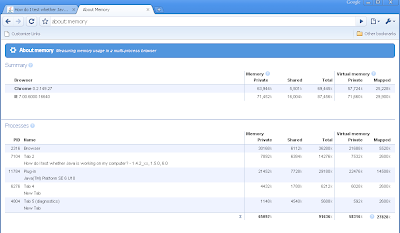 So I made a MySQL cluster. Now I can run at the same time two instances of this Mail Handling System in different sites. Now one site can fail and the other site can still work on. The MySQL cluster software make sure that the data is always stored, available and in sync on two nodes. Off course you can use Oracle Data guard or RAC but this is much easier and a lot cheaper. I was suprised how easy it is to make a cluster. This blog entry will show you the steps. I will use three x86 sun solaris 10 servers. Two servers are the storage nodes and one is the management node (The load of the management node is very low so you can easily add this to a existing server). 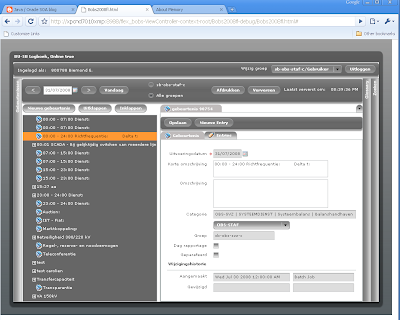 http://dev.mysql.com/downloads/cluster/index.html#solaris_tar in my case the solaris software. I don't use the default mysql folders. This are my mysql folder locations. And I changed the default mysql parameters because we need to support big xml files. Just change it or remove these parameters. First step, installation of the mysql software. mysql-ndb-1# chown -R root . mysql-ndb-1# chgrp -R mysql . Today I heard some rumours that JDeveloper 11G ADF edition will be released this month. This is very great news. I thought that it will take at least another 6 months before Oracle will release JDeveloper 11G. I saw today that a JDeveloper 11g ADF application works perfectly with BEA as the embedded application server in JDeveloper 11g. I must say the execution of a webapp in JDeveloper has changed a little bit. In OC4J you can run the webapp without a deployment. With BEA as embedded AS, JDeveloper has to create a war and ear file first and then these files are deployed to the BEA application server ( You have to start BEA first). 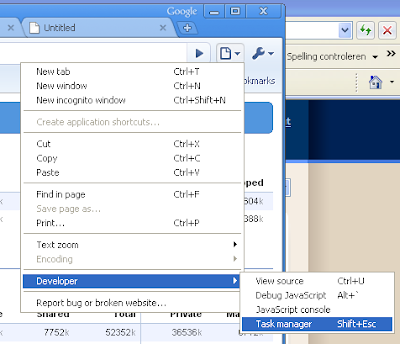 With Exadel Fiji you can use Flex in a JSF page. For more infomations see my previous blog. 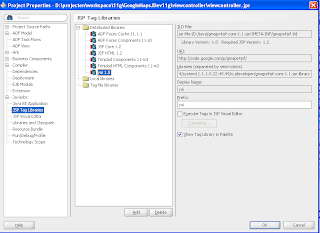 This blog will show you how you use fiji & flex in JDeveloper 11g. This will not work in jdeveloper 10.1.3. The first step is to download Fiji from http://exadel.com. To make this work in JDeveloper, we need to disable the trinidad code and configure Exadel Richfaces and Ajax4jsf. We need to add the fiji taglib to the project. To do this, Go to the project options / jsp tag libraries and press Add, click user and press the New button. Now we can select the fiji-ui-1.0.0.jar. We need to remove all other taglibs except jsf-core and jsf-html. Now we can add the right libraries to the project. We can use the following libraries of JDeveloper 11G Facelets runtime, commons-logging, common-digester and common-beanutils. The rest of libraries comes from the fiji lib folder. See the picture for all the used fiji libs. Don't use the commons-digester of JDeveloper. Use version 1.8 of fiji download. This is how the web.xml look like. You can better make this file readonly else JDeveloper 11g will try to add the Trinidad filters. We had to remove the oracle default render kit from the faces-config.xml and add FaceletViewHandler for Ajax4jsf. Make this file readonly else JDeveloper will try to add the default render kit. The backing bean code with the retrieveWelcomeText method which I use in the remote object (Flex). 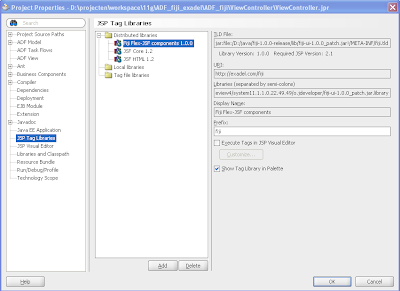 jsf xhtml page with the fiji:swf component. This element has two sub elements the first is a simple param component which pass its values to flex as a parameter. The second component is a endpoint and this is used by the remoteobject. Here is the flex code where we use Application.application.parameters to retrieve the parameter value or a reference url for the remoteobject. That's all. Here you can download the JDeveloper 11g project. Maybe you already saw this news at the serverside or by James Ward but Exadel just released Fiji. With Fiji you can use Flex applications in a JSF page and interact with the other JSF component or backing beans. I already tried this too but Exadel got it working with a lot of great options. You can develop now better looking and richer JSF applications with cool video or charts components. 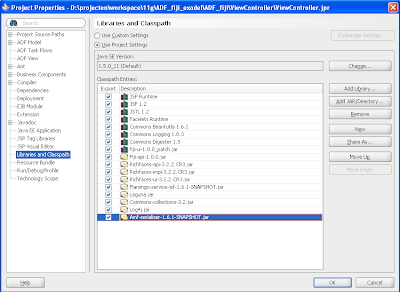 These flex applications can be a part of the jsf application without using blazeds or lifecycle. And of course you can use Flex to build complex parts of your jsf page ( like Charts, Drag and Drop, Video or Trees) and you can do it a lot faster and it is easier. Here can you see the exadel jsf flex demos or read more about Fiji at the Exadel product page . 2) use HTTPService to retrieve any value of a backing bean method. 3) use DataService to retrieve the result using AMF format. 4) Invoking Ajax Request to send events to other parts of the jsf page. This gives you already a nice overview. or you can type about:memory in the url input. This gives you more memory info. So let's test some websites ( like cnn.com and my own blog), an ADF 10.1.3 , ADF 11g application, an applet and a flash application. Here are the results. A normal website ( Tab 2 and 5 ) use about 26 MB of memory, the most complex 10g ADF page ( Tab 9) use 22MB and ADF 11g website gives me a not supported notice. 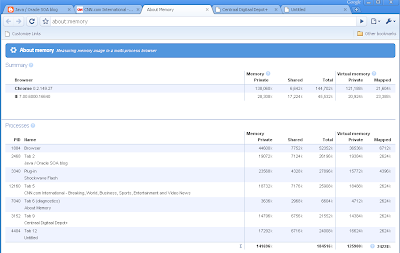 Chrome also shows flash as a different memory process. A big flex application can take 50MB of memory and a small one 22MB. Too bad I can't not run a java applet with the current installed jre. I need to install Java SE 6 Update 10 RC beta. You can download this at http://java.sun.com. A simple Applet takes about 29MB of memory. In this blog item I will you show how easy it is with RoR and RubyAMF to do CRUD operations on tables with associations. RoR and RubyAMF makes it very easy. I used for this blog a simple department and their employees use case. Create a new Flex application. First we will create the employee and department actionscript class. That's all. 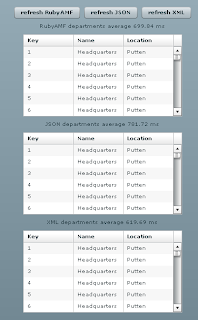 you can easily create and retrieve departments with it's employees with RoR and RubyAMF. RoR and RubyAMF do all the hard work.